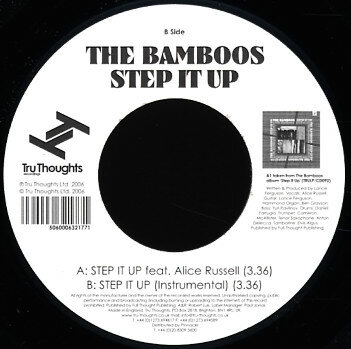 The Bamboos - Step It Up 7"
Excitement flows through my veins as i'm about to put the needle on the cute little 45 I've just received from Tru Thoughts HQ... 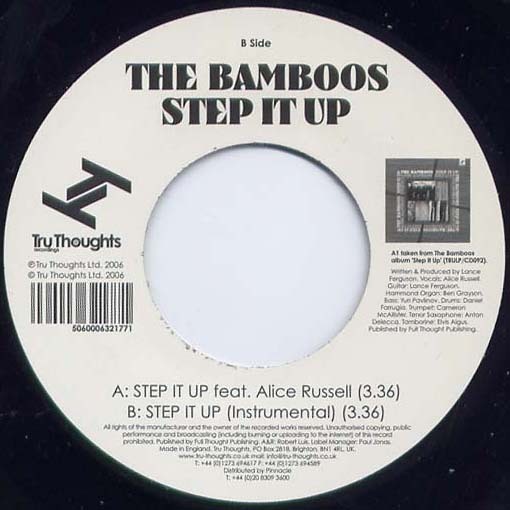 Yes it's the new Bamboos single, "Step It Up"!!! From the first notes and beats one thing is obviously immediate and immediatly obvious: it's a dancefloor hit, 100% sure! The bassline is the kind you can't stay seated on, very repetitive and entertaining, heavy and bouncing non stop 'til the end of the track. Funk dressings are served as well, of course, with the funky guitar and its solo dessert, peppered horns licks, ducky background vocals and breakbeating drums all over. Gosh that's a funk bomb or what? Let's check the b-side... F*$%! That WAS the b-side!! Twas the instrumental version of the "Step It Up" I'm now hearing, which adds some storming vocals from none other than new Soul-Funk Queen Alice Russell (if you haven't checked her second album "My Favorite Letters", or her featuring on Quantic Soul Orchestra and other Tru Thoughts artists releases you should do so - trust me on this one). My my my... The song is now over and I can't help but play it again. That's a confirmation: a hit. The press releases talks about another Alice Russell featuring on the forthcoming album, a cover of Afronaught's extraordinary beautiful broken beat classic "Transcend Me". Ok. Where's my agenda? I've got one Bamboos album to buy on glorious vinyl and a Breakestra concert in Paris in March... Just perfect! If you want to know more about this australian funk band, see also their complete discography. 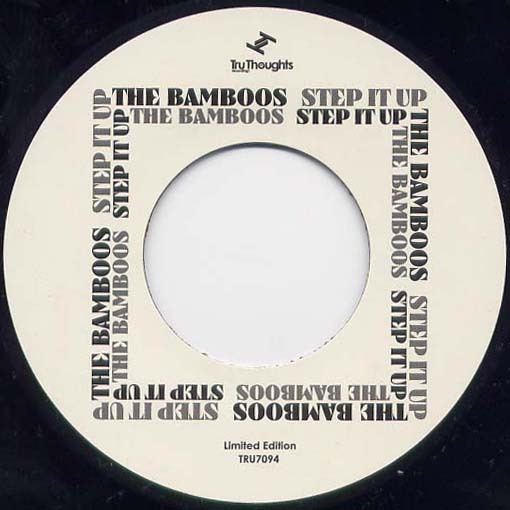 The Bamboos hail from Australia and picked up a huge amount of fans on the back of their self funded 7" pressing which was limited to 300 copies worldwide. From this they signed a single to Kenny Dope and Deb Darge's Kay Dee Records which helped cement their reputation amongst the world's Funk community as well as fans of heavy dancefloor beats. The forthcoming album collects this,the first single, as well as new versions of the Kay Dee releases, alongside new tracks which include two tracks with Tru Thoughts artist Alice Russell, the funk bomb 'Step It Up' and the cover version of UK Broken Beat don Afronaught's 'Transcend Me'. Having toured as the backing band for the Quantic Soul Orchestra and Alice Russell in Australia, as well as in their own right, the one thing you can be guaranteed about The Bamboos is that musically they are supertight!